Mike Mannor | mannor.com – Welcome to Mike Mannor’s website and blog. Mike is a professor of business strategy at the University of Notre Dame and blogs on issues of creativity, innovation, and strategy with a focus on highlighting people and organizations that inspire in their efforts to make a positive impact in the world. Check out the NYTimes coverage of this issue: NYTimes on BioHacking. Confession: I love Uber. Check out my op-ed on Uber’s awkward / stormy adolescence published yesterday by Fox: Uber exits the unicorn years and awkwardly steps into adolescence. Can it survive and thrive? I’m not sure what my favorite part of the Elizabeth Holmes story actually is. It is tempting to focus on the w hole “self-made billionaire” bit, or the “billionaire before the age of 30“, or that she has 84 patents to her name while also running a hyper-growth company. There is also the fact that she recognized that her age would be an obstacle for investors, so she assembled what some have called the most impressive board of directors ever. Of course there is also the “female version of Steve Jobs” angle, as he is apparently also her idol, and she is doing a killer impersonation. But no. Instead, my favorite thing about Elizabeth Holmes is that she and I share something important – we are both wusses. According to Inc., Holmes has a deep seated “aversion to needles“, which helped inspire her to approach the blood testing market from a new angle. The focus of most business model innovation is identifying unmet value that can be created for customers, and she used a well-established fear as a starting point. From there she has guided her ideas into some pretty awesome directions, guided by cutting edge science, to destroy the typical business model for the $73 billion diagnostic-lab industry with extremely inexpensive blood tests that can be conducted with no-pain blood draws of tiny samples that allow a huge range of tests from a single sample. All of this is then implemented in tiny labs, outside of the typical doctor’s office setting. Now she and her company (Theranos) are racking up FDA approvals to bring this all to market, starting with a huge partnership with Walgreens. Starting with a clear value proposition, and then driving that insight into transformative new directions guided by research-driven science, Elizabeth Holmes has the world at her fingertips. She has her sights set on creating a new market and ecosystem that does not yet exist – one that focuses on a more democratic approach to medicine with an empowered and informed patient that better monitors their own health throughout their life at a reasonable cost. I’ll bet this is just the beginning. I have always been interested in what the most powerful / smart / successful people in the world do after they create their great work or leave their high-profile positions. Where is the afterparty? Do they move to the background and pull the strings that control the puppets that run the rest of the world? Do they just retire into the freedom of the caribbean? Do they make symbolic gestures or motivate big changes in the world? Do they work harder than ever? Surely, some do each of these things. That’s it, I’m checking out. JD Salinger never wanted to be famous are avoided it at all costs. He wrote in “The Catcher in the Rye” of his main character Holden Caulfield hating “phonies” and wanting to go live in a cabin alone where he wouldn’t have to talk with anyone. In a sense, that is exactly what JD Salinger did, moving out of New York after achieving some success to a secluded existence on 90 acres in Cornish, New Hampshire. He is reported to have written extensively for the rest of his life – in more than 50 years of isolation – without publishing much of anything. What did he write? Will any of us ‘phonies’ ever see any of it? One of the greatest American writers in history, but he doesn’t think anyone deserves to share his work. How many other Howard Hughes / JD Salinger / or other scientific or literary or mathematical genius types through history have just checked out and simply cut themselves off? I’m sure historians could put together a pretty high-powered list. Power brokers. Bill Clinton was a US governor at 32 years old, president by 46. After two terms as the most powerful man on Earth he was done by the time he was 54. Then what? He became the pre-eminent power broker in the democratic party and has invested his time heavily in the Clinton Global Initiative, a high-powered group designed to bring powerful business leaders, former heads of state, nobel prize winners, and other influential people together in a call-to-action to help improve the global condition. In this role he has been able to continue his hold on influence and has enormous sway as a world-wide power broker. Save the World. Bill Gates holds mythical status in modern society for a variety of reasons, not the least of which is his title as the “richest man in the world.” He is a well-respected techie and business leader. In 2009 he mostly checked out of the company that had created him to do something bigger. With the Gates Foundation (see previous post) he has created an organization that is already the world-leader in making philanthropy more like a business with clear goals and huge impact. By managing his foundation more closely, he can write a letter to stakeholders like the one he recently released, talking about the 250 million children he is saving with one new vaccine, and the 500 million starving people he is helping to feeed with new drought resistance crops. I exaggerate, but only a little. Gates has traded in making money for saving and improving lives. In a sense, Al Gore has done the same, but more focused on a single cause (climate change). Gore now has an Oscar and a Nobel prize to console him as he curses the hanging chads in Florida’s election ballots. Get Richer. More than a few people upon exiting their high-profile situations just turn their genius-power, public service history, or other notariety into bigger bucks. Names that might get mentioned here include anyone from Nathan Myhrvold (his “Intellectual Ventures” is not exactly a non-profit) to Elon Musk (PayPal to SpaceX andTesla Motors) and other serial-entrepreneurs. Given the other ambitions on this list (saving the world or enhancing the arts) this may seem like a selfish play with one’s talents, and maybe it is, but we can’t fault talented people from creating companies, creating new jobs, and creating wealth. It is no less than the American way. Enhance the Arts. Eli Broad has had wild success, building two Fortune 500 companies (KB Homes and SunAmerica Financial). In a sense, he gets the title of “get richer” together with his fascination with the arts for going back after making his fortune to try to do it again with company #2. He currently is a noted philanthropist, focusing his efforts on a variety of efforts from improving K-12 education to supporting stem cell research and his named business school. However, a huge focus for Broad has been on the arts. In addition to holding one of the greatest private art collections in the world, he has given endlessly to support museums and to protect and provide access to the arts. On and On…. This list could go on and on. In coming years it will be interesting to see what Obama, Bayh, and others do with their new-found freedom. Who Says Big Ideas Are Rare? Malcolm Gladwell is clever. Anyone who has read his books can quickly deduce this. However, perhaps what is most clever about Malcolm Gladwell is that he recognizes that cleverness is not necessarily all about being smart. In fact, most of the truly great things that people get credit for were not really invented by them. Henry Ford did not invent much truly new, he just was exceptional at making it work together. Andrew Hargadon had a recent post on his blog about this issue as well, but for every great invention / business / whatever you can name, I can find three people who could probably lay claim at the idea first. It’s not that ideas are not precious, or necessary, it’s just that they are not enough. Malcolm Gladwell is best known for several books (Tipping Point, Blink, etc.) that take well established ideas from many domains, repackage and add new insights, and make him into an icon. The fact that most of these ideas are not original Gladwell creations does not diminish his contribution, and he’d be the first to tell you it was not all him. It’s about putting things together in the right context, with the right people, and sometimes the right business model. This simple insight could be pretty influential for those who seek big ideas. Be an idea harvester, not just an idea creator. For many people, the biggest issue in politics today is jobs. To me, it seems that America could learn a lot from Mr. Jobs about creating jobs. 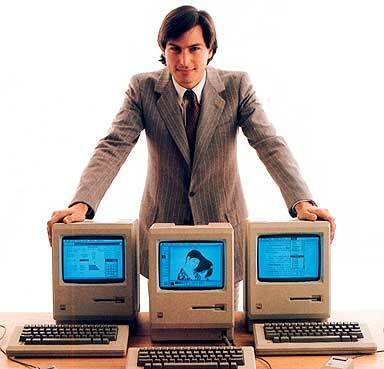 From the beginning, Steve Jobs was an imaginative and farsighted thinker. He built Apple into one of the most valuable companies in the world by focusing on two things: 1.) Creating value for people with innovative products that simplified people’s lives and 2.) Constructing new markets from scratch for these products. Think of all of Apple’s biggest revenue drivers: iPod, iPad, iPhone, iTunes ß each of these constructed a new market from scratch. Apple has excelled because they construct new markets that create value in people’s lives. Why is it so great to be in the [market] construction business? There are big advantages to this approach: Better margins, less competition, more job growth, and first mover advantages. When you pioneer, you set the standards – just ask Mark Zuckerberg at Facebook! The market construction business is not easy, but it’s worth it. Market construction requires a different frame of thinking. The questions revolve around what could be rather than what is. Leaders think about how customers might re-imagine their experience of a product (think Apple’s mouse for computer interaction; mobile music libraries; a person’s entire life in their pocket command center). Market construction also requires a different approach to marketing / development. Questions become: Who is the customer? (You must find them because they don’t know they need you yet). What do they want from the product? (They don’t know yet. You have to educate them). What is the right price point? (You decide, based on the value you create for customers). America has struggled to truly transition from ‘old industries’ where we had strong capabilities (for example, the auto industry, textile industry, and most manufacturing industries) into ‘new economy’ markets that are only beginning to emerge. The good news is that America is exceptionally well prepared to lead in this century, but we will need to follow Apple’s example of leading on new frontiers. The biggest areas for growth in the next 20 years, essentially the real estate with the largest “green fields” ready for market construction, will likely be in the areas of: Life sciences (personalized medicine), technical services, green technology, new sources of power generation, nanotech, pharma / medical devices. Essentially, the government can double down on [market] construction. Steve Jobs was a visionary. America could use a new generation of visionaries that put on their hard hats as market construction engineers and deliver the jobs of the future. For more, I was part of a panel on “To the Point with Warren Olney” on PRI/NPR talking about these issues: click here for a link to the broadcast of the show. Kirby Ferguson has put together a fantastic short video series that nicely describes an idea I’ve been trying to highlight in my research for a long time – that very few “breakthroughs” are really about creating something truly new, but instead are more about copying, slightly transforming, and combining other people’s ideas. Simply: breakthroughs are a myth, and copying is king. In the series of 3 videos linked to below, he shows how even masterful / novel contributions to music (video 1, highlighting Led Zeppelin), movies (video 2, highlighting Star Wars), and technology (video 3, highlighting Xerox before the Mac) are really remixes. Very powerful ideas that run counter to society’s views on creativity!